After a successful failure the first go ?round, the New York Anime Festival could only get better in it?s second year. Thankfully, it did. Attendance and overall organization was up giving the convention a stronger and more positive vibe this time. Cosplayers were also happy to trade in the December chills for a muggy September rain and appeared in full force. A varied guest list showed off big names who were appropriately given panel rooms this year and not made to present at the back of the dealers room on a stage that was sectioned off by curtains. The dealer?s room itself did unfortunately close promptly six o?clock, but panels and screenings ran later into the evening this time to keep attendees in each other?s anime loving company for a few more hours. Such improvements should be duly noted, but the fledging con still has a long way to go before it can settle into an established identity that has a consistent quality standard. The movement towards showcasing a larger swatch of Japanese pop culture, as seen with bringing in Masaharu Morimoto of Iron Chief, fine art friendly Yoshitaka Amano, and loli fashion designer Baby, The Stars Shine Bright, is a promising direction to be headed in for the con?s future. However, bringing in these guests only to fall back on crowd Q&A?s for the entirety of a panel doesn?t do anybody any favors. Such was the case with Morimoto-san?s forty five minute block which contained a shining example of such dangers when a Naruto Shippuden cosplayer ask if Morimoto-san knew and was friends/related with the Morimoto of Nintendo fame. Uh, right. I ended up learning a lot of what Morimoto-san?s likes and dislikes were by the end of the panel but little else. The same can be said for the amateur run panel Kingdom Hearts: A Fan?s Point of View. The two speakers brought a topic and their bodies to prop up the microphones but little else in the ways of informative or creative content. On the other hand, Amano?s panel provided an appealing balance of a thought out interview, crowd questions, and limited prize give-away. Having evidence of preparation was really the deal breaker for most of the panels I sat through and, unfortunately, a lack of this was in the majority. The main floor stayed fairly consistent from the year before and remained pleasantly bland. The most notable change was the consolidation of the artist alley to the side of the dealer?s room/main floor space. 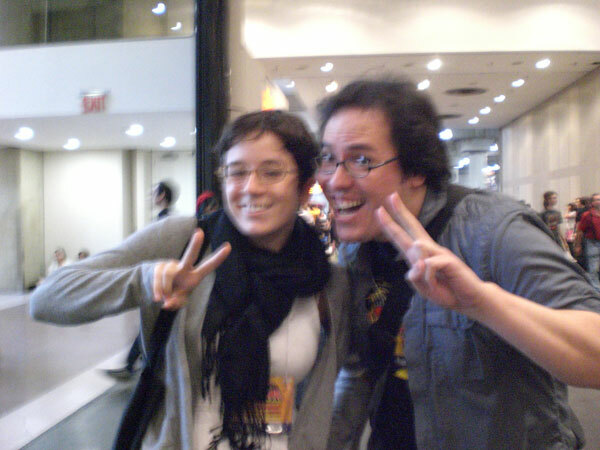 It gave a lot of the artists more face time with the attendees but many of the artists saw slow sales and remained uncommitted to a positive return appearance at N.Y. Anime Fest ?09. Artists with original content had an especially hard time moving their wares and the state of the economy certainly wasn?t doing anyone favors. At the end of the day though, for all its faults, I still found myself having a good time. The opportunity to be in a crowd that loves the same the niche market that you do is something special. Seeing new fans with bewildered parents in toe and old fans heralding the classics will never tire for me. This anime convention is no different from any other in the fact that I always walk away with an over priced import item, the mental scar of seeing an especially inappropriate cosplayer and the prospect that next year will be bigger and better. … I’ll be back with my own report, as well as the requisite mountain of visual aides, plus a few extra thoughts from Hilary later tonight/early tomorrow morning. This is TOO true. I always try and think of my panels as an interactive experience with the audience and also as visual presentation. Because just talking is BORING! But I also admit that the more effort I put into making panels like live stage shows the more burnt out I am from doing them. Which is why I declined doing any this year at NY anime fest. So I give credit to anyone who takes up the challenge!